Did you know that the Kitchn is hosting a cooking challenge this month? That’s right, time to get out of that rut you’re in and try something new! The first week was breakfast week. And I have definitely been in a breakfast rut, so…good timing! I realized that I typically eat sweet and grainy breakfasts. I hardly ever eat eggs or vegetables before noon! So when it was time to set goals for breakfasts future, that was mine: eat more veggies and eggs for breakfast. I kind of cheated on one of the “assignments” and didn’t actually look up any new recipes to try. But, hey, I did write down a few ideas I wanted to work into the morning lineup! 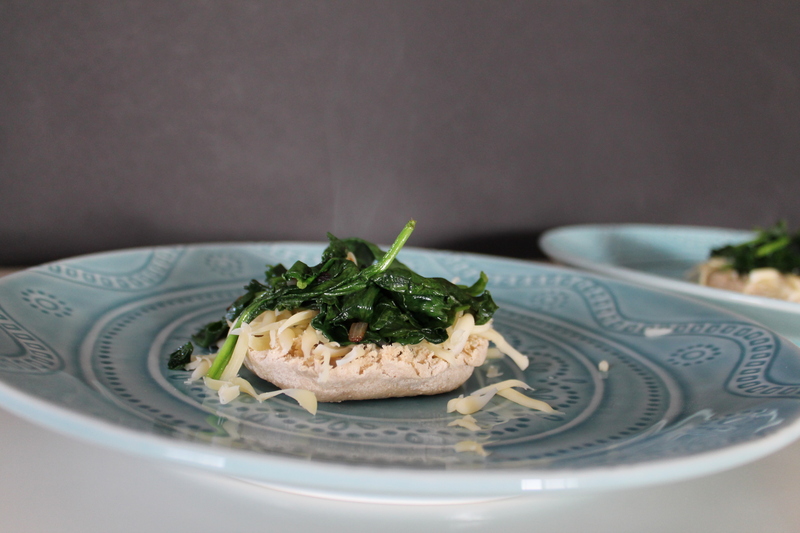 And the first one that made the cut was eggs florentine. I must admit that I love runny yolks any way they come, and eggs florentine has long been one of my favorite eggy treats. It’s so rich and sumptuous! I decided to model this dish after the fancy breakfast I usually order when I go to Eggspectation, so I added in a few slices of smoked salmon and a side of blanched asparagus. You know…so I could look myself in the eye after licking my plate clean (because at least I ate some vegetables with all that buttery hollandaise…). 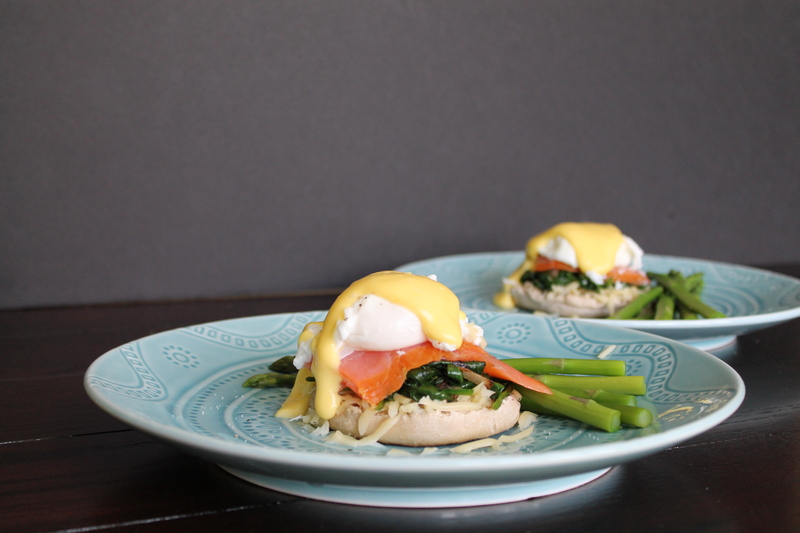 If we’re going to make eggs florentine (or even eggs benedict, for all the carnivores in the world) we have to start by making a hollandaise. This seemed a bit daunting to me for a breakfast food, and I definitely think it’s more effort than I would like to make on a regular basis, just to infuse some life back into my breakfast routine. But it’s a weekend! And weekends are all about brunch and taking your time. So I went for it. I use Julia Child’s hollandaise recipe, and it has never failed me. I didn’t take many pictures because I didn’t want my hollandaise to die while I was focusing and snapping. I figured deliciousness was a little more important in this case. You will need 8–10 tbsp. unsalted butter for this recipe. I don’t really understand where the variance comes in, because I am not Julia Child. She wrote something to the effect of gauging the natural ability of the egg yolks to absorb the butter without breaking…but I just figured more butter is better. Then I thought it might be better to use only one stick of butter…and I ended up splitting the difference and using 9 tbsp. total, which follows no real logic at all. You can do whatever suits you! Start by melting 6–8 tbsp. unsalted butter in the microwave (I used 7). Set it aside and get to work on the egg yolks. In a small saucepan, whisk the egg yolks vigorously for 1 minute. Julia seemed to think they would become slightly thicker and sticky. I am not sure they really did that, but I whisked a little extra just to be sure. I did feel like my arm might fall off if I continued whisking, and then I decided I had done my due diligence. Add lemon juice, water, and salt and whisk for another 30 seconds. Don’t stress if the mixture seems really liquidy at this point. Drop in 1 tbsp. cold butter and set the saucepan over low heat on the stove. Whisk constantly until the butter melts and the eggs thicken. After my butter melted, it took another 5 minutes before my eggs thickened. 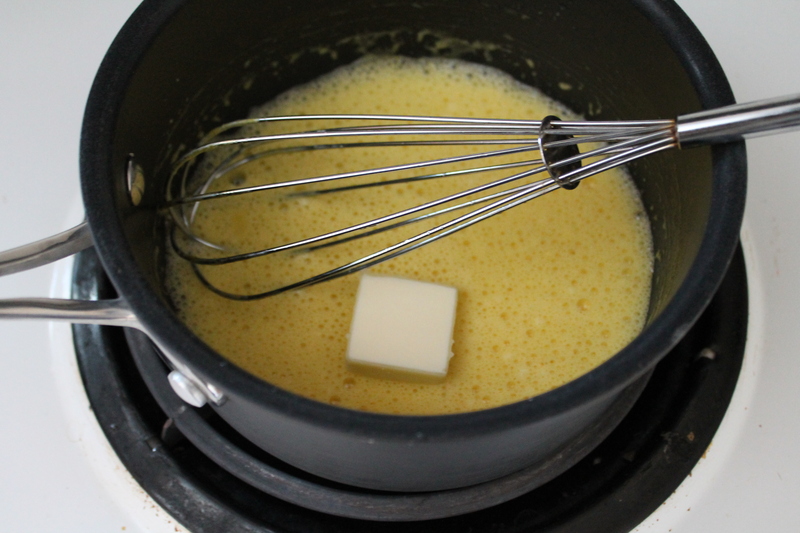 Remove the saucepan from the heat and whisk in the last remaining pat of cold butter. Once the cold butter has incorporated into the mixture, you are ready to start dripping in the melted butter. I (foolishly) had not melted my butter in a measuring cup, so I ended up splashing small amounts out of my Pyrex bowl into the hollandaise instead of streaming in a nice, steady, slow drip. Either way, make sure the butter is being incorporated very slowly! It should never puddle. I worked mine in a few drops at a time, and whisked between each small amount to make sure the hollandaise stayed nice and thick and the butter was mixed in well. You can season yours some more, if you like. I tasted mine and felt like the lemon and salt were in balance, so I stuck with it as is. 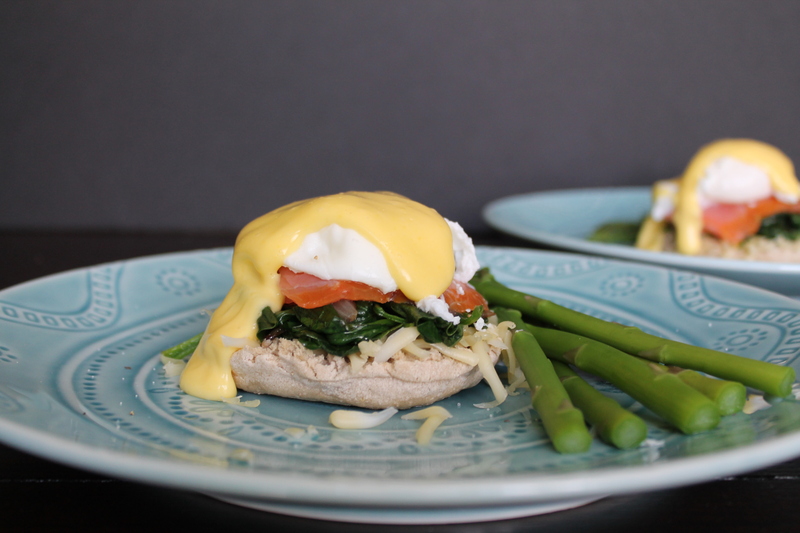 Cover the hollandaise with foil to help it stay a little warm and move on! Now everything else except the eggs can basically happen at the same time. Unfortunately, this is a dish that has a bunch of different components and you will need to use almost every pot and pan in the cabinet. Oh well. It’s totally worth it! Pull the English muffin apart with a fork and toast it well. I purchased multigrain muffins for this breakfast, but you can also make your own! 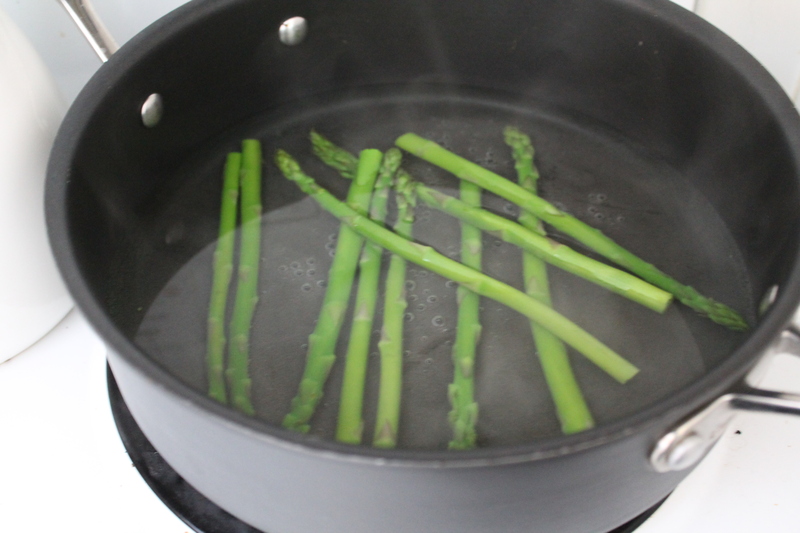 Bring a large pot of water to a boil and toss in the asparagus. After 1–2 minutes, when it is bright green and pliable but not floppy, run the asparagus under cold water to stop it from cooking any longer. Chop up half of a shallot (or a whole one, if yours is quite small) and cook it over medium heat until it begins to become translucent, about 3 minutes. Toss the spinach into the pot (I measured one handful per English muffin half) and stir until it is all wilted. I chose not to salt the spinach mixture because smoked salmon is super salty, and the dish would be balanced as a whole without a ton of extra salt. But then again, I tend to prefer things on the less salty side. Now, assembly. For me, one egg stack was plenty for one breakfast. It was a lot of food! Set half an English muffin on each plate. Top with shredded Swiss cheese (I used Jarlsberg, which I found on sale this week, whoo!) and the wilted spinach. Lay two slices of smoked salmon over each muffin. Time to poach the eggs! Bring a pot of water to a boil. Pour in a teaspoon or so of white vinegar—this will help the egg to stay together when you drop it into the water. Poach the eggs one at a time. Drop the egg in the water and let the pot come back to a low boil. Boil for 2 minutes, then scoop the egg out with a slotted spoon. Set the egg on one of the muffin stacks. Repeat with the remaining eggs. Sprinkle a little salt and black pepper over the eggs and drizzle the whole stack with hollandaise. Yum. Don’t forget to lay the asparagus on the side! It’s so delicious with the hollandaise and runny yolk. Melt 6–8 tbsp. butter in the microwave and set aside. Place the yolks in a small saucepan and whisk vigorously for 1 minute, until slightly thicker. Add the lemon juice, water, and a big pinch of salt and whisk another 30 seconds. Add 1 tbsp. of the remaining butter to the pan and set the pan on the stove over low heat. Whisk constantly until the butter melts and the eggs thicken. Remove from the heat and immediately whisk in the last remaining tbsp. butter. When melted, carefully drizzle in the melted butter, whisking constantly to incorporate, just a few drops at a time to start, and then a slow stream. 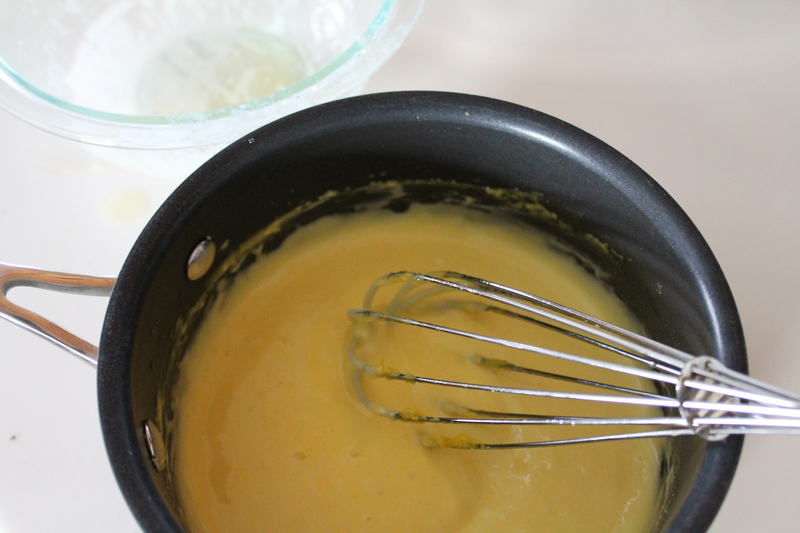 If the hollandaise begins to look liquidy, stop drizzling the butter and whisk until it comes back together. Taste and adjust lemon and salt as needed. Cover with foil to keep warm and set aside. Trim the woody ends off the asparagus. Drop into a pot of boiling water and blanch for 1–2 minutes. The spears should be bright green and crisp-tender. Scoop the spears out of the hot water and transfer to a bowl filled with cold water to stop them cooking. Heat the olive oil in a large skillet over medium heat. Sauté the chopped shallot in the warm oil, stirring regularly, until translucent. Add the baby spinach to the pan and stir. 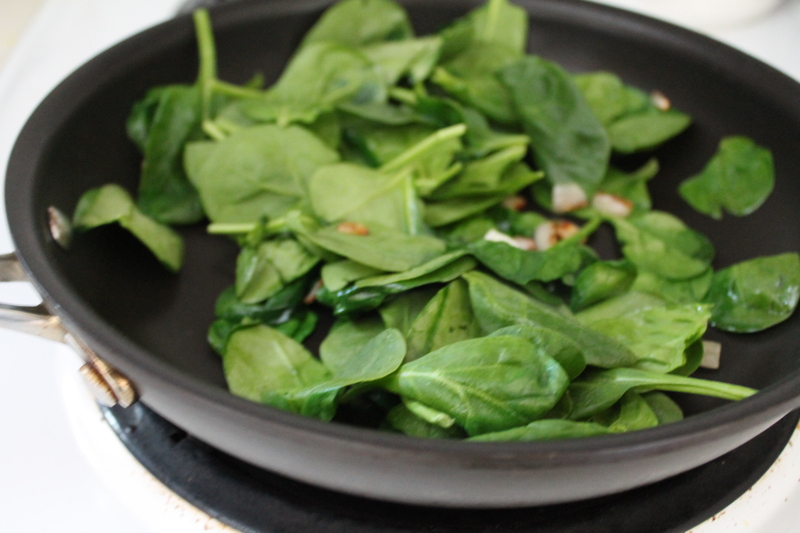 Cook, turning frequently, about 2 minutes, until the spinach wilts. Do not allow the spinach to turn black or burn on the bottom. Meanwhile, toast the English muffins and top each half with shredded Jarlsberg. Spoon the wilted spinach over the muffins. Top with smoked salmon. Poach the eggs one at a time in a small pot of boiling water (optional: season the water with vinegar, adding a small splash before poaching each egg)for 2 minutes each. Gently lay the eggs on top of the muffin stack and season with salt and black pepper. Spoon the hollandaise over the eggs. 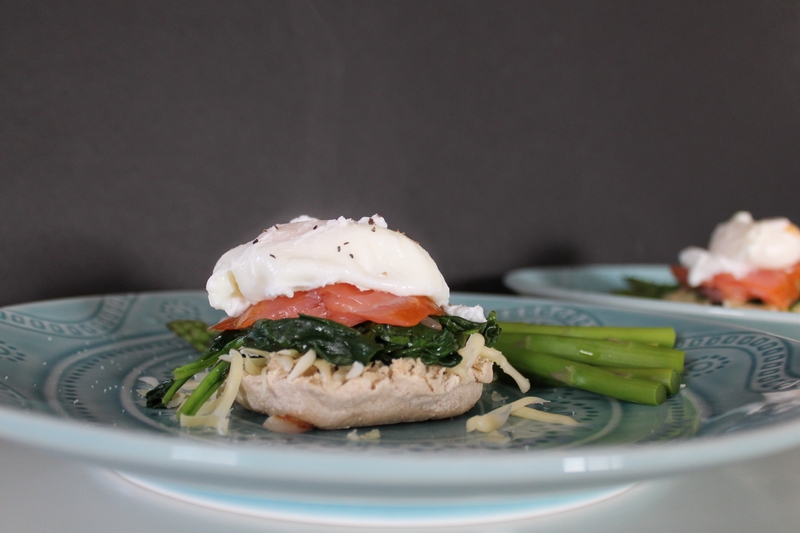 Set the asparagus next to the eggs florentine and serve the plates warm. Yum! I like to do any combo of eggs, avocado, and salmon in the AM to jump start the day with healthy fats and protein. Oh man, I just took your avocado suggestion and added a few drops of white truffle oil. Heavenly!